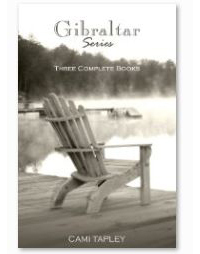 The Gibraltar Series includes Gibraltar: A Novel, McKenna, and Brannon: Course of Dreams. Raised by her nurturing father and grandfather, eighteen-year-old Clary has never known the kind of resistance that brings out the best and the worst in people. As the son of a hard-hearted businessman and his unhappy socialite wife, Jem has never known anything else. Besides the connection to a cottage on the St. Clair River, the only thing Clary and Jem have in common is an unusual last name, until the revelation of a family secret begins to redirect the course of their future. Abandoned by his father as a child, and losing his mother to a drunk driving accident as a young man, Paul Jessup has overcome his own alcohol addiction through the help of his faith, and a wise and caring mentor, Father Carlos. After Paul meets a young woman named McKenna Franks, she and her close-knit family open the eyes of Paul’s lonely heart to see potential he’s never dared to accept for himself before. When an important opportunity leads him away, will he keep the door of his heart open, or will he succumb to a familiar voice from his past instead—Whenever something is gone, it’s gone; when it’s passed, it’s past; when it’s out of your reach, you’ll never reach it. As Jem and Clary make a decision about their future, Paul is lost in indecision over his own. Clary struggles to maintain her relationship with Paul, while fearing that the reappearance of Jem’s uncle in Brannon will threaten any chance her father might have with Jayne. Through confusion and sorrow, joy and realization, the love of family proves faithful, as the Borderlines face big changes together in this third installment of the Gibraltar series. Cami Tapley was born in a remote country hospital in Washington state in 1963, and then never really had a hometown while growing up. She moved with her parents from the northwestern U.S. border, state to state, town to town, to the southwestern border, and then shortly north again, to the L.A. area, and then to the central valley of California, where she met her husband. The moving actually picked up again not too many years after she married, as they traveled with their two young children from the Pacific to the Atlantic coast, up into eastern Canada and back again. It all changed in 1997, when they came to the beautiful maritime “thumb” of Michigan, and stayed. In Cami’s experience, she realizes that most people live within a certain proximity of where they’re “from,” and that isn’t something that can be imitated, rather, observed. Her life has largely been one of observation. She knows firsthand that home is more than familiarity or appreciation, it’s an intangible reality; that element of purpose, the product of love’s overshadowing influence, without which the tangible is only a location. Cami writes to share a little of what she has observed, and today, she is part of a Michigan proud family, along with her husband, son, daughter and son-in-law.